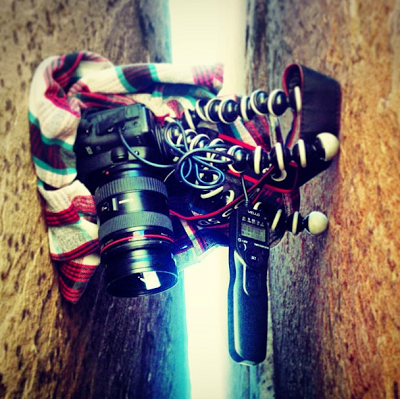 Serious camera rigging in the name of offwidth climbing photography. Here are a few photos I've shot recently that I'm pretty excited about. At time's it can be hard to convince myself to lug around the big SLR and I occasionally settle for snapshots on the mobile device, especially on long all day routes. Sometimes the best camera is the one you have with you, but that's no excuse not to get quality images when you have the time. There is nothing quite as rewarding as the process of getting a high quality, thought provoking, well composed climbing photograph. It's an adventure in itself just trying to get into position and anticipate the best shot. These two photos from Zion were actually from our "rest day" from doing longer climbs, but I managed to convince the boys to get on the Intruder 5.11+ with no warm up. They did pretty damn well! My part was easy, I just aid climbed it in 5 minutes and made sure to bring a beer to drink at the top. The three of us seemed to gather some attention from the passing by tourists and some bikers stopped to take photos of us climbing and shooting photos. Rock climbers might be one of Zion's main attractions... they should let us in for free... and feed us! 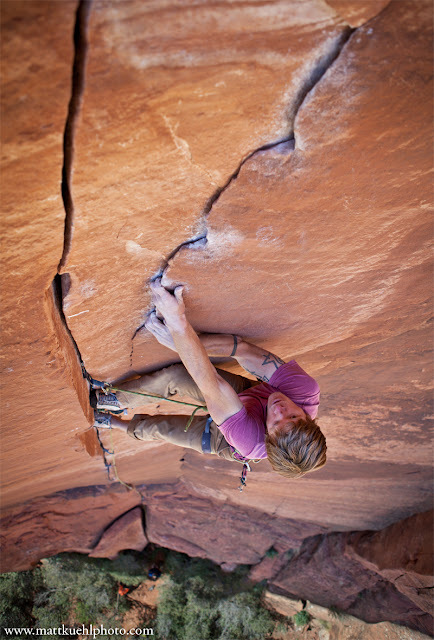 Andy Hansen on Intruder 5.11+ in Zion, Utah. Ryan Strong on Intruder 5.11+ in Zion, Utah. I also have just recently started to experiment with a photo idea I've had some time. Often I encounter problems with a lack of people to shoot, not enough belayers, or a hard to get angle where a person doesn't really fit (i.e. deep inside a crack). My solution to the problem was clear, I needed to experiment with camera rigging with an automated shutter release. The concept is easy to understand, but the execution is the real test. 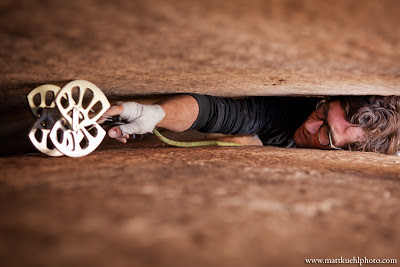 So recently when stuck with no available climbing partners and a photo deadline to meet, I went to see what I could do. Rigging the camera up inside a crack was my first objective, and it was a precarious and delicate process consisting of much jingus-ness and improvising... my strong point! 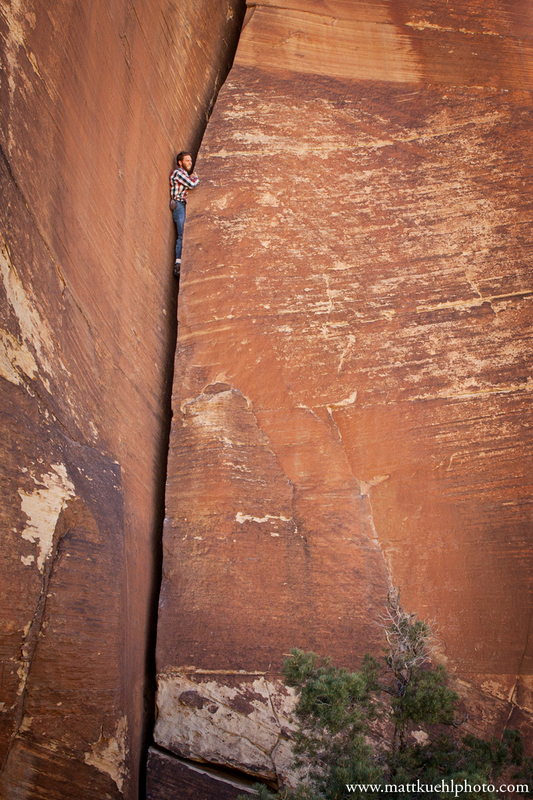 Self portrait solo on Chrysler Crack 5.9 in Red Rocks. My second objective was to do a more full-scale shot of a climb from a distance with the camera set to shoot in increments of 10 or so seconds. Keeping with my wide-crack ways I decided Chrysler Crack would be a fitting climb. I have climbed this crack many times and it's difficulty lessens significantly with every passing arm bar. A while back, this was my first true offwidth I attempted. On that try I couldn't even figure out what to do! The second time (after climbing many other harder offwidths) I did it without any trouble and only placed three Big Bro's for protection in the whole 90' feet. The third time I did it in 2 minutes and 30 seconds and set the new "world's most pointless" speed record. And the fourth time I did it sans-rope. Clearly, once your figure this thing out it becomes pretty mellow. Whatever way you climb this thing it is a classic! 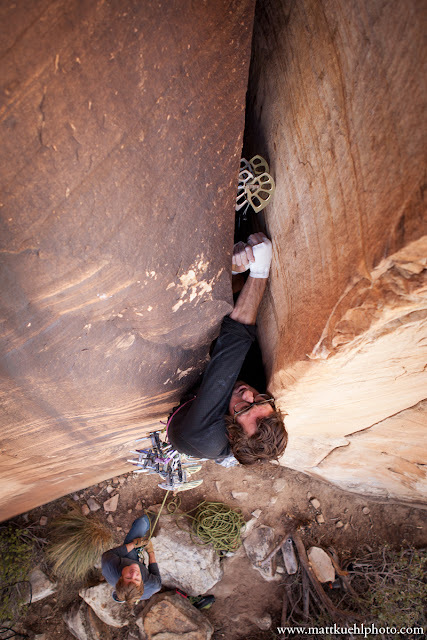 Jason Molina on Beelzebub 5.11 in Red Rocks, Nevada. 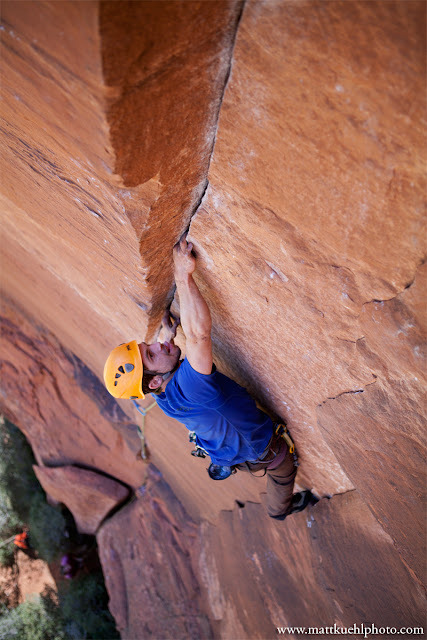 I also finally got around to shooting the obscure wide route Beelzebub 5.11, which I think is one of Red Rocks most impressive and clean cut offwidths. This route tackles a long offwidth crack that splits the center of a beautiful streaked wall and is about 70' of a clean cut 6 inch crack... Woohoo! Finally burly fist stacks and heinous thigh scums and heel toes for a looong while. This thing is a beast and I can't wait to get more images of it once the desert temps drop more in the fall. But in the mean time, these two images should give you a little taste of what it's all about. Cheers! Nice solo of Chrysler! However, I'm very disappointed you didn't post up that awesome shot of my head inside Beelzebub. Grumpy cat. Thanks man, it was a pretty fun time. That's a good shot and a true OW shenanigan moment, I considered posted it but will have to save it for a later time when it be most hilarious! I am an outdoor explorer specializing in climbing and photography. I live an interactive lifestyle focused on experiencing and documenting the lives of outdoor enthusiasts I encounter. I enjoy being a part of the activities I photograph and you can often find me on both sides of the lens. Pinnacle Cave, Mt. Potosi, NV.